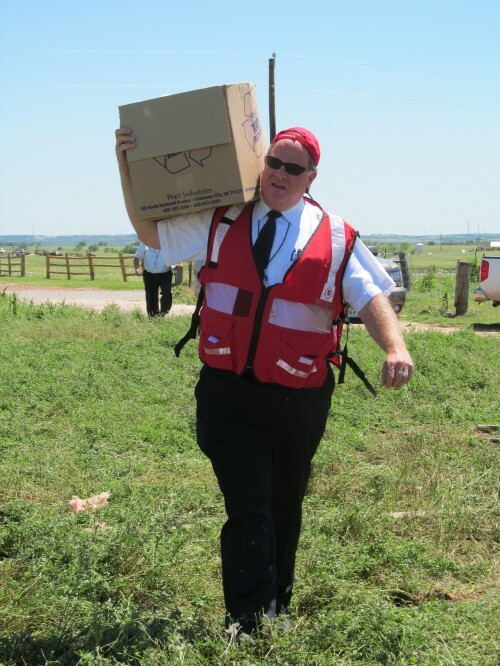 The Salvation Army is constantly evolving and changing the way it responds to disasters! 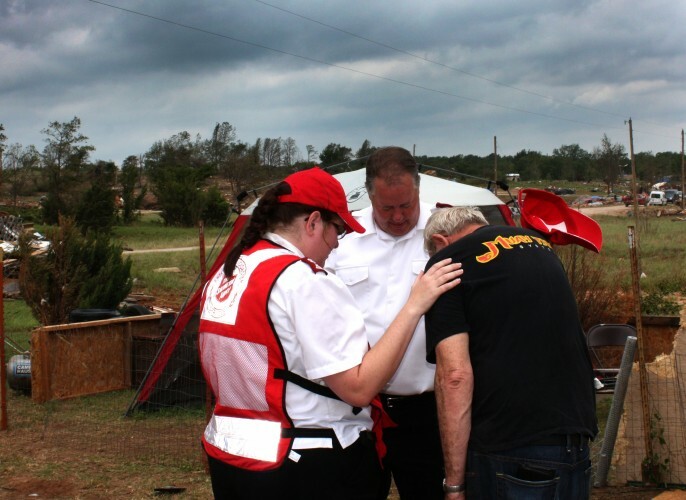 Due to the impact that this tornado had on the people in this area, The Salvation Army wanted to make the Emotional and Spiritual Care support to be a priority in our initial service delivery. While Emotional and Spiritual Care has always been an understood in our disaster delivery service, the Army is now deploying officers (ministers) and carefully chosen, trained volunteers as Emotional and Spiritual Care Specialists. These ESC personnel are tasked with the care of not only affected people, but also other disaster responders. The Salvation Army sent one of the largest continents of ESC personnel to this disaster response in my memory. Because of the increased response in this trained personnel, we were able to deploy ESC teams with trucks and other vehicles to affected areas as “spiritual care ground forces.” These ground force teams were able to get into some areas that our mobile feeding units could not get into and offer assistance. Some of the areas were so damaged and difficult to traverse that the ESC teams were forced to walk along roads dragging coolers of cold drinks and snacks. Far from just offering physical comfort, these teams were bringing the love of God to places that had seen such sorrow! I had a chance to work with these teams for my first two days here in Oklahoma. These dedicated officers and volunteers took to their work like trained soldiers. Every morning, they would go to the distribution warehouse and load up with supplies. From drinks to snacks to candy to small toys, they were loading up “ammunition of love” to be shared with everyone they came in contact with! They prayed as they walked! They prayed as they talked! They spoke hope to people who did not have any hope! The days were long! Some of the teams had to seek shelter during inclement weather. There were sunburns and tired feet, exhaustion and emotional wear. But, these faithful soldiers trudged on and brought hope, peace, and love to the people of this land. Pray for the people of Oklahoma! Pray for those who are helping! Pray for those who will be staying and helping in the future! God Bless the people of Oklahoma! God Bless the work of the responders! And, God Bless The Salvation Army! Great article! I am proud of you!